I love the Spanish fashion brand Desigual, I find it so creative and inventive that to date it's influenced three separate crafting projects of mine. First was a scrapbooking page featuring the wonder of my Desigual skirt, followed by a greeting card inspired by my partner's Desigual trousers ... while today it's their eclectic range of bags which has been inspiring me. When I spotted these bags in store there was only one thing stopping me sprinting to the till to buy them ... their price tag, at something like £60:00 it certainly made me pause to think. ... I finally left the shop declaring "I could make something like that!" *Paste* My starting point was a canvas tote which was free with some promotional thing at work! I found a pack of 12 crocheted coasters in a £1 shop and experimented on it with some heat transfer dyes left over from a class given by Efemera Ink, to create this focal point: And had great fun adding a bit of retro bling with these studs! I'm so pleased with the end result! However it actually might not be the end as I can see myself altering and adding to it forever! So there it is - my own take on a Desigual design .... which hardly cost me a penny! ... so that one of you can create your own bespoke tote too. All you need to do is leave me a comment below making it clear you want to win! The closing date for entries is 23:00 [BST] on Sunday 16th May and the winner - chosen at random - will be announced ASAP afterwards. You know what? I actually like your bag better than the "originals"!! It is really fabulous - amazing what you can do when you really, really want something but can't afford it! And you're right - you could carry on adding bits here and there, perhaps replacing some bits you're tired of, or that get a bit worn. I know a wonderful young lady who would love to have a bag like this (my niece). I'd love to win the prize and make one for her birthday at the end of the month. Please count me in! Oh my! I'm loving the eclectic styling and the way you've made over something that might otherwise have been stashed in a cupboard getting dusty. How much would I love to win this? Lots! Oh yes ! yes! yes! I would love to win!! 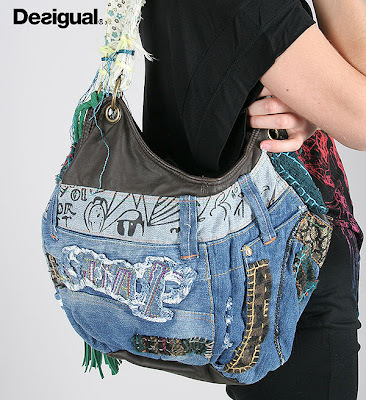 Your bag is gorgeous and so is the Desigual one but I would also find the justification for that price! 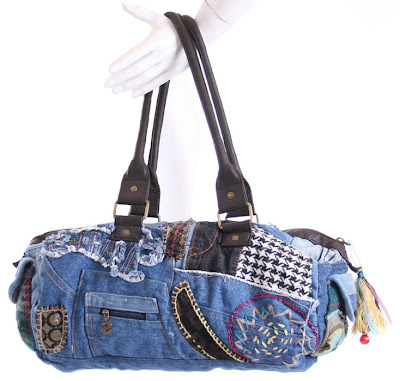 Stunning bag, one to add to the 2 fat quarters and a fat half bag you made earlier. Could this be a new career path. As much as I'd love to own a bag like this I really don't think my sewing skills would do it justice so I won't enter this draw but thanks for asking. ASAP, ASAP, ASAP...is that clear enough? It's got my name on it! Me, myself and I are all over this. Just discovered your fabulous world from The Pink Couch and I love it!! Fantastic idea with the bag...your touches are amazing! LOvE the chance to make one for myself...fingers and toes crossed! What a stunning bag Julie & yes I would love to win. You inspired me to rescue my sewing machine a few weeks ago & its itching for a new project, so either way I'm going to have a go at one of these ... now where did I put those ripped jeans with unusual pockets?? Oh wow, now that I'm hella inspired from the above two posts I am really hoping to copy a Desigual bag too, these materials would come so in handy if I were to win! Oooh I love the bag, it's lush, I would love to win the bits to make one myself. That bag has inspired me to have a go at some sewing myself. I just love your version Julie and I think it looks better than the orignal and I'm sure that didn't feature the flies masquarading as a pocket. I'd love to win you always have great taste when it comes to fabrics. ME please!!!!!!!!!!!! I want to win. I've been enjoying the weekend as well. Great birthday party. I love the fabric inside and outside of the handles - lovely details. I'd very much like the chance to play around with fabric and denim and bags, so please add me to your random draw. Thanks! My sewing machine has just been given it's own space on the workbench in my newly designed (OK - cleaned up and sorted) craft room. This is JUST the sort of project it's crying out to be allowed to do! Pick me, pick me, please pick me. I would LOVE to win this! The tote is awesome and it would be so cool to make one of my own. Your bag is every bit as fabulous as the ones you coveted in fact - for the pure genius factor of the use of flies... probably more fabulous :P Just love it! THIS IS SO AWESOMEEEEE!!!!! I REALLLLLLLLYYYYY WANT TO WIN!!!!!!! Does that work!??!? I love your bag!!!! That is wonderful and I must have a go! And yes, I'd love to win because now I'm feeling inspired. Oh lawks! Too late to enter and I would have LOVED to have been in with a chance of winning. I adore embellishing things. And all the lovely things you've done are very inspirational.